Awakin Teens with Arun Dada! WHAT: On Saturday, April 20th @11AM, we're delighted to host a circle for teenagers with lifelong Gandhian, Arun Bhatt, in our home. To join, RSVP below. This will be a rare opportunity for youth to circle up, dialogue and Q&A with a man whose dedicated his entire life to service. 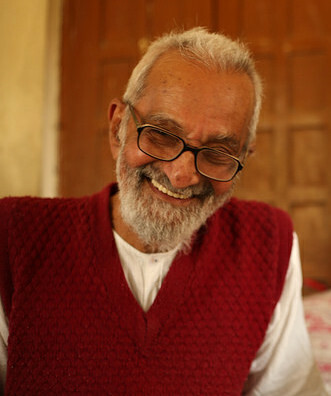 Arun Bhatt ("Arun-dada") has dedicated his life to simplicity, service, and nonviolence. Born as the son of freedom fighters, Arun-dada spent parts of his childhood in jails, an unlikely setting where he encountered remarkable forces of love. At 19, he walked across India with Gandhi's spiritual successor, Vinoba Bhave, as part of the Bhoodan (Land Gift) Movement. His untiring equanimity and gentle compassion has dispelled tensions while held at gunpoint, and given rise to remarkable journeys of transformation. He has never sold his labor in all the decades since -- even after marriage and raising two children. "Nature will give me whatever I need, even if that means suffering," he says. Every aspect of his life is a gift that is offered to, and accepted by him. Now, in his 80s, his eyes are still shining. :) All good that is bestowed upon him, he pays forward. He sings soulful songs, he shares stories, he smiles from a distance. He quietly blesses, without ever trying to. If you'd like to join, do RSVP below and we'll be happy to share more details!